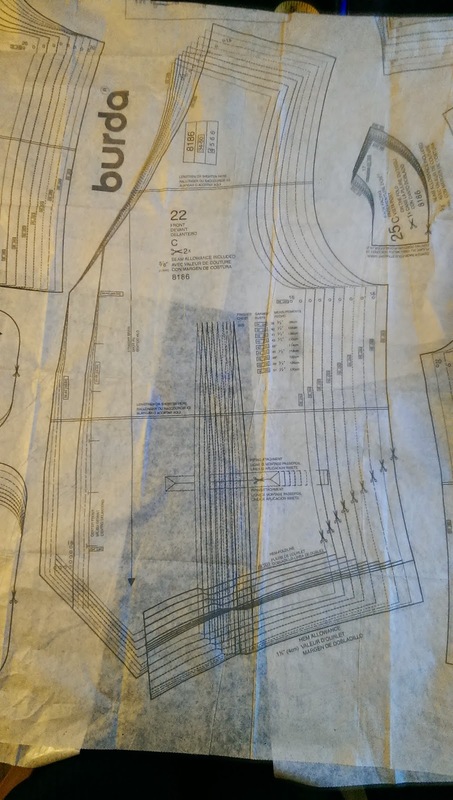 Jennifer's Sewing Space: Finished Burda 8186. So I completed the instructionless (or so it seemed) Burda waistcoat! a while ago admittedly but it proved rather hard to get photographic evidence!! I only had one major disaster and a couple of minor points which I hope to improve upon for the next time I try them but overall I think this turned out well. What do you think? How cool are these buttons!! 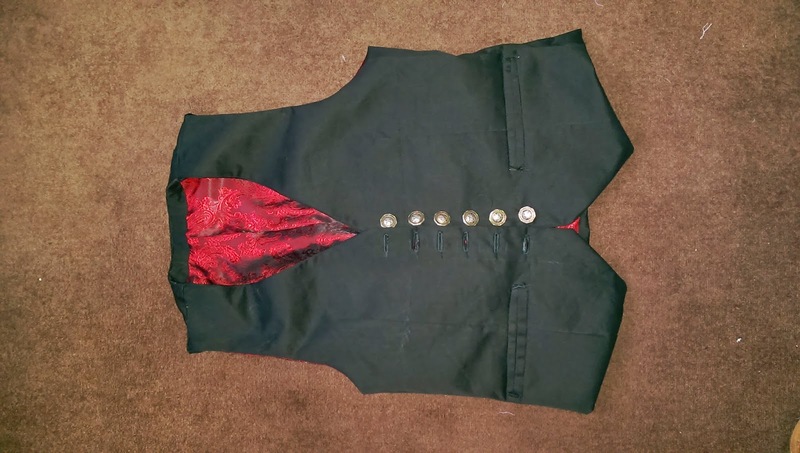 We decided that from the outside the waistcoat looked nothing special so to give it a unique feel we trawled the buttons in the store and found the most unusual ones that could hold together the front adn create a diversion from the attempt at welt pockets. I think they look quite 'Alice in wonderland' esque. 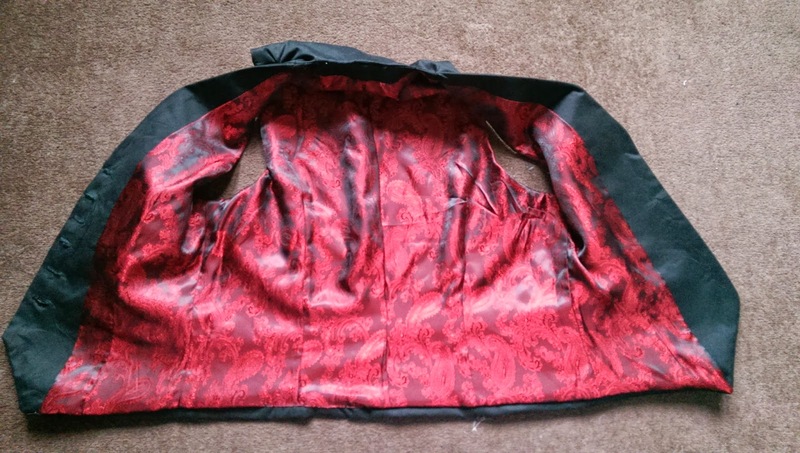 I was so pleased that I managed to line up the button holes so well - me and the automagical button hole function aren't really the best of friends! One feature that I like (and which was horrifically explained) was the pleat in the back of the lining I thought it made an interesting design feature. 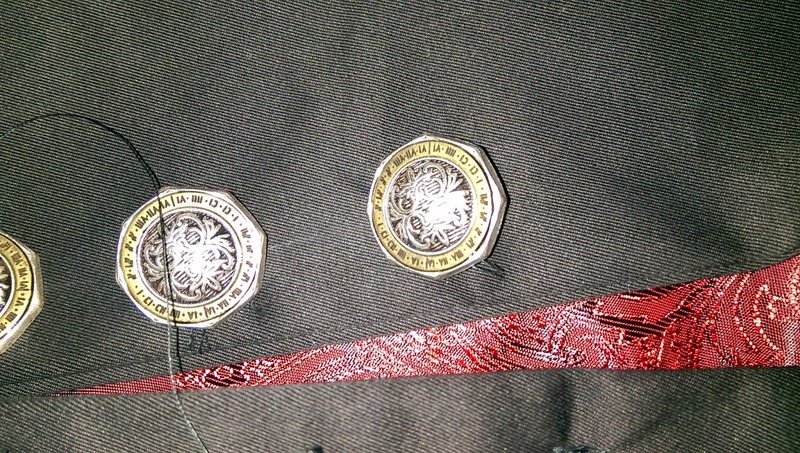 The only thing I would change the next time construction wise would be to make the waistcoat a little longer. The John isnt exactly a giant in stature (about 5' 10) and it does come a little short. Admittedly this wasn't the best shirt to wear and I think he should have tucked it in but when I was getting photos from an unwilling and hungry other half I wasn't going to moan too much. Has anyone else tried this pattern? I want the Dahlia but have had terrible fitting issues with Colette patterns. Please do share your Dahlia (maybe it will motivate me to give Colette another chance). Hi, I bought and printed the Dahlia today and the instructions for making it up in plaid - feeling equally excited and nervous! Good luck with yours - looking forward to pics. Love it … I’m obsessed with vests right now I want one for myself . Can’t wait to see your tweed Dahlia … what … so curious!!! Thanks :-) I enjoy making things for other people because I reckon that they must think I'm cabable or they wouldn't ask - gives the ol' ego a bit of a boost!! I may go back to burda eventually however only if I feel they have something that an Indy or other mainstream companies don't have!! Fabulous, I always salute those who make for family members are just really CBA! sorry. Totally agree everything should be lined with that red paisley. Looks great! I like the lining. I would like to trying making something for a gent, just don't really have anyone to see for. Oh that sounds so sad! Wasn't meant to ha. Looking forward to seeing your Dahlia. I'm holding back and seeing what people see them up in first.